It's 3:00 am. You wake up with a chill and see the bedroom window is cracked open. You shuffle out of bed to close it and grab another blanket from the closet. On your way back to bed you see the cradle in the corner still has the "auto rock" on and is swaying gently. You go over to see your month old baby sigh deeply in her sleep. She's perfect. All ten toes and all ten fingers. From the perfect puff on her head to the tiny freckle on her pinky toe, she's perfect. Suddenly you're seeing her first birthday, her first boyfriend and Prom and college flashing before your eyes. You softly touch her cheek, tuck the covers in around her a little tighter and slide back into bed. It's 3:00 am. You wake up with a chill and see the bedroom window is cracked open. You shuffle out of bed to close it and grab another blanket from the closet. On your way back to bed you see that you still haven't moved the cradle. The empty cradle. The cradle that once held your perfect depiction of Love. The cradle that you and your husband put together three months ago. Then, after a month of pure joy, your world turned inside out. The day you realized you would never see her first birthday, her first boyfriend, Prom or college. The day you found out your baby girl was diagnosed with SMA. This is a situation no mother or father ever wants to find themselves in. But unfortunately, more than a few do. According to a study, Spinal Muscular Atrophy (SMA) is the #1 reason for infant death. And even more unfortunate is the fact that it doesn't have to be this way. There are cures just over the horizon in labs and minds of Scientists. But there is no funding for something so few of the population know about. In these situations, people grieve in a variety of ways, some strange, others wondrous. Brenda Barberena lost the little love of her life to SMA almost two years ago. Since then, she has been an advocate for various teams fighting for a cure for SMA. She has been a spokesperson, a campaigner, and a friend for those grieving their own loss. This August, she became a board member and director for a non-profit organization called hopeforsma.org. It is a voice in the darkness for those who are fighting and those who have lost. The plea for awareness encourages those who feel that no one knows what they are going through. "Hope for SMA" speaks publicly for those whose hearts are aching. It reaches to people outside the circle of pain. It raises hope. This August was a huge stepping stone for Brenda and her cause. 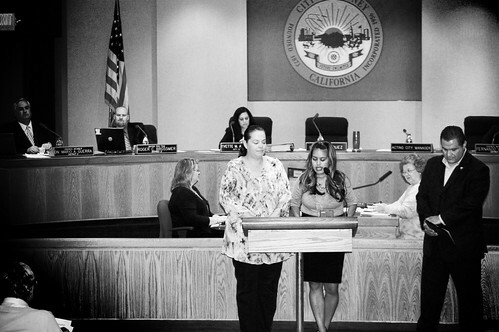 Not only was her organization started, but our beautiful city of Downey proclaimed August as SMA awareness month. The City Council awarded her this Proclamation last night at their meeting where Fire fighters, Policemen, and people of the city listened to her story about her baby and her fight. This fight is far from the end, but steps like the one our city took raises hope that soon, others will be making these steps to funding and finding a cure.